Designed specifically for the home worker and installed by our skilled crew in a matter of days, the Solo range of garden offices contain all the elements required to successfully work from home. The Solo is fully insulated, complete with toughened double-glazing, multi-point locking, lighting, heating, telephone and data points. This dedicated and self contained workspace provides a private, warm and secure working environment. 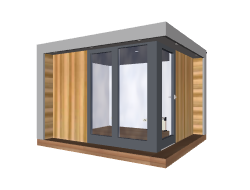 The Solo garden office is discreet and compact, but floor to ceiling windows and doors set in the corner give it a light and airy feel. It is ideal for gardens where space is limited. Who says you have to work in a shed?